I’ve decided to go through Summer Express: 101 Simple Meals Ready in 10 Minutes or Less and make as many of them as possible. Here’s the first one I tried, #25. Notes: I may never make tuna salad any other way ever again. 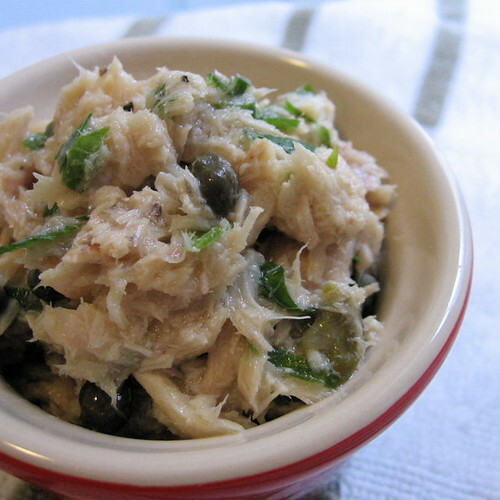 I didn’t find tuna in olive oil, only soybean oil; next time I’ll make more of an effort to find tuna in olive oil. Parsley was quite good, but I really wish I’d had dill instead. Stuffed tomatoes…? No thanks; I ate this on a bed of red leaf lettuce last night and again for lunch today on a baguette. Working through that list is sure to get me over this cooking slump. I won’t even admit to half the junk we’ve been eating these days. I’ve started cooking from the list too. This is going to be a great summer! One place to find tuna in olive oil is Trader Joe’s. They carry a lovely Italian brand, Tonna Genova—and for less than I’ve found it elsewhere.